This post has been mouldering in my drafts folder for several months as I pondered the relevance of banging on about Exhibition Road, and shared space, once again, but it’s probably worth releasing, even if much of what I say has already been said before. 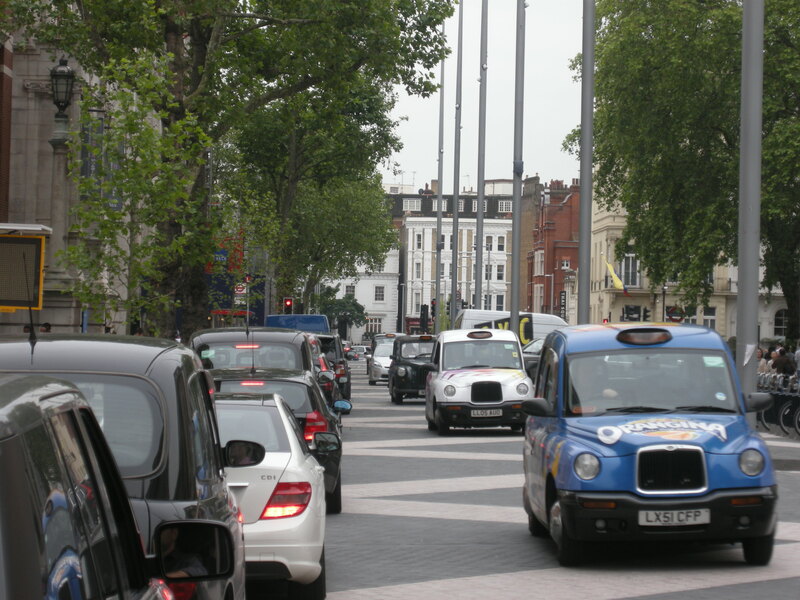 It’s unlikely that a road as expensive as Exhibition Road will be proposed in the near future. 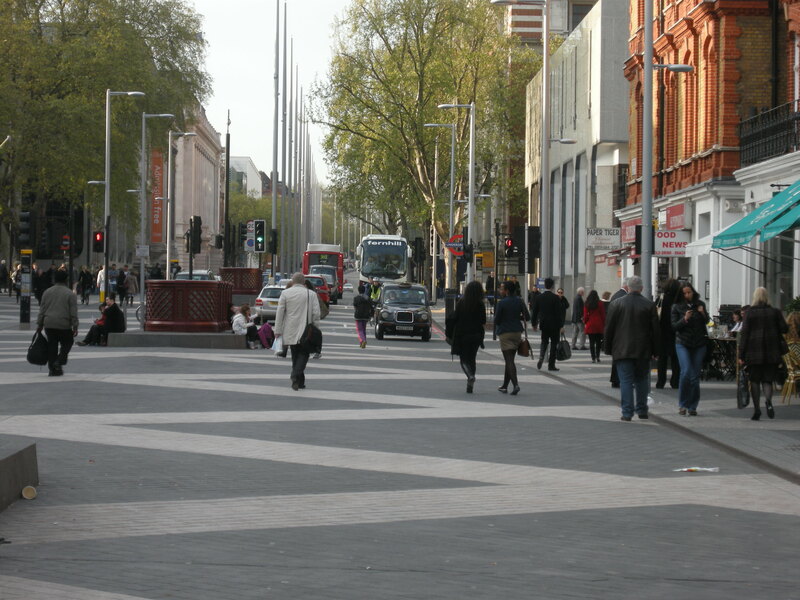 At £35,000 per metre (£29 million for 820 metres), it is most definitely a very costly experiment in street design. The cost of the street may prove to be immensely valuable, however, in demonstrating some of the limits of the application of ‘shared space’ philosophy. 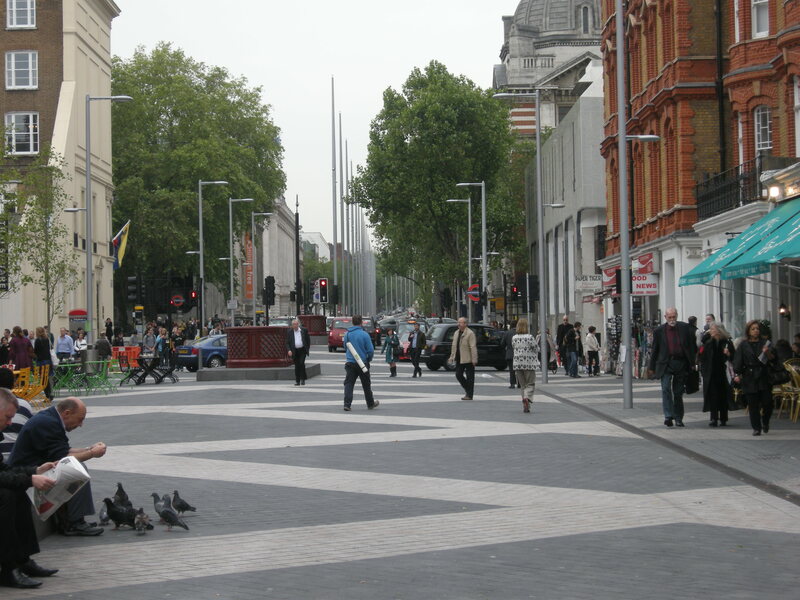 It is important to stress that I do not dislike, or detest, the redesign of Exhibition Road – indeed, it is better than what was there before. Nor do I argue that the environment for cyclists and pedestrians has not been improved – I think it has. I also believe that a small degree of uncertainty introduced by the new arrangement does, in general, lead to slightly more careful driving than would be the case under the previous arrangement, and also that the road might be safer. I have already written two lengthy pieces detailing how shared space is erroneously being presented as something of a universal solution to the improvement of our streets and roads by a number of urban designers and transport planners, as well as by a good portion of the media. A case in point is Simon Jenkins, perhaps one of the most vocal journalists in favour of shared space, whose output on the topic is fairly prodigious – two articles last year on the topic, in short succession, and media appearances in which he disparages the separation of motor vehicles from people, and overstates the advantages of shared space. It is 20 years since towns and cities across Europe began redesigning their streets, moving from the traffic – circulating zones festooned with railings and traffic lights beloved of British town planners. Some 400 European towns have converted thoroughfares to spaces adapted for all to use, with redesigns that respect rather than abuse the buildings facing onto them. 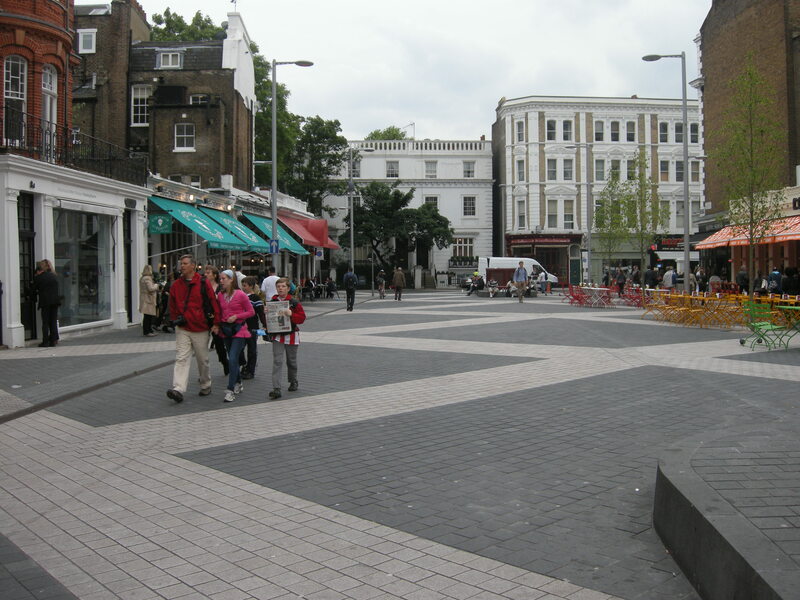 London has, over the years, pedestrianised some of its shopping streets, such as South Molton and Carnaby and Leicester Square. It has attempted a few, highly dangerous, bus lanes and contraflows, such as in Oxford Street and Piccadilly, the latter now abandoned. The boldest council was Tory Kensington and Chelsea, first dipping a toe in the water at Kensington High Street. This was partly stripped of signs, railings and clutter. Bike refuges were put down the centre to encourage people to linger in the roadway and junctions were raised. Pedestrians now wander at will, slowing the traffic and rendering the neighbourhood people-friendly. There has been a 60 per cent drop in accidents and a relative pick-up in retail lettings. 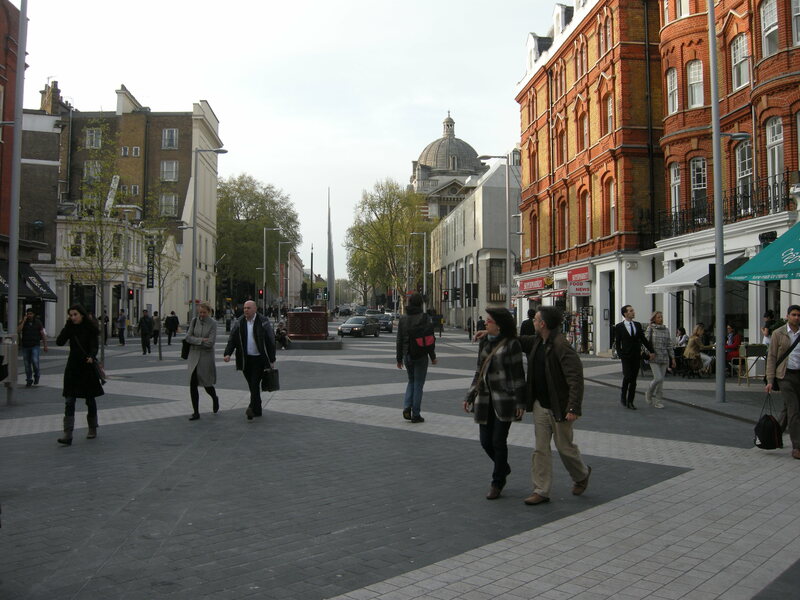 Kensington High Street – the redesign that Jenkins considers the most bold of this period – has been improved, it is true. The pavements are wider, and much of the guardrailing has been removed. 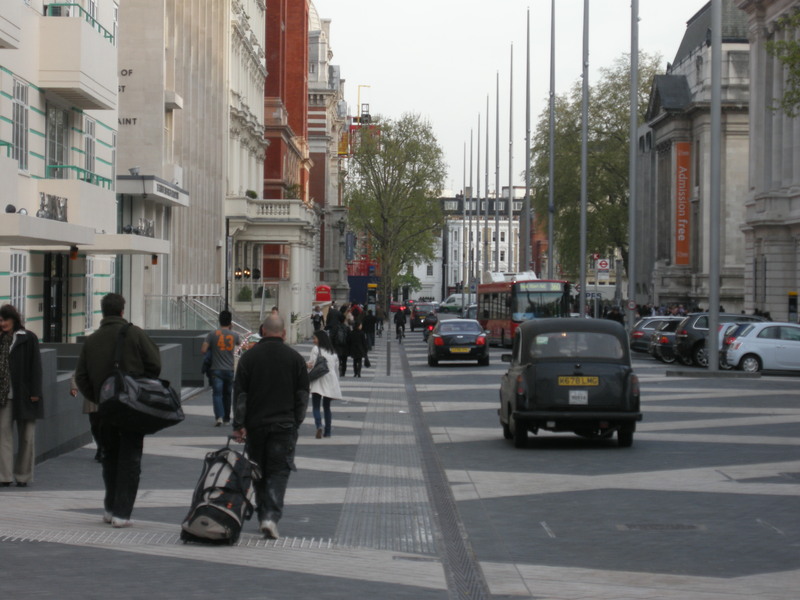 But it is simply incorrect to say that pedestrians ‘wander at will’ in the carriageway, ‘slowing the traffic.’ Try this – attempt to just meander about at leisure in the road on Kensington High Street – and you will be honked at, driven at, or possibly even run over. Now of course people will be crossing the road here at places (largely) of their choosing, but to suggest that they are doing so ‘at will’, or that they are capable of slowing the traffic in doing so, is dishonest. They will be crossing when motor vehicles are not approaching – crossing, that is, in ways rather similar to how they crossed before, prior to the removal of clutter. The claims Jenkins is making for the new civility of Kensington High Street are exaggerated. Shared space, or “naked streets”, is a concept still little understood by a British public steeped in the old religion of urban traffic. This holds that road space is for vehicles alone, their drivers being, by definition, irresponsible, stupid, selfish zombies whose safe driving can be assured only by physical barriers, lights, signs, road marks and highway codes. Potential victims – that is, other road users – must be corralled and caged along congested sidewalks in what is an iniquitous allocation of space. That is, segregation represents the ugly, failed 1960s approach to road design, in which pedestrians and vulnerable users are ‘corralled’ and ‘caged’ away in small areas of road space, for the convenience of motor vehicles. 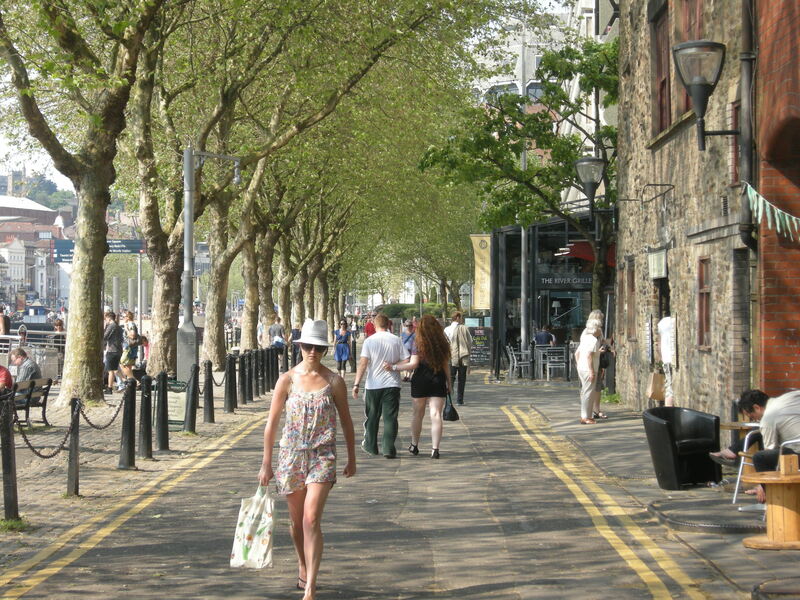 The only alternative we have to this bankrupt approach, it seems, is that of shared space, tried and tested across the continent, which ceases to keep vulnerable users tucked out of the way, and acknowledges that our streets and roads are not just for cars. But as I have said before, this is a false choice, in that it presents shared space as the only alternative to the pedestrian- and cyclist-hostile segregation of the 1960s and 70s. 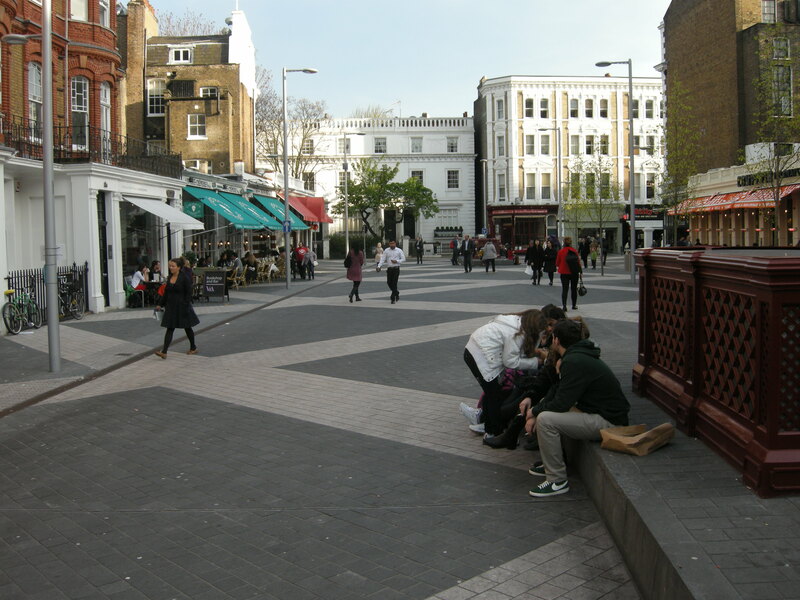 It glosses over – indeed ignores outright – the potential we have to improve our streetscape for vulnerable users, by methods different to those employed by shared space; namely by segregation itself. The concept of ‘segregation’ – so evidently detested by shared space devotees like Jenkins – can be used to ameliorate our urban environment for vulnerable users. Not, obviously, in the ways it has been employed in this country over the last 50 years, but in ways seen on the continent (the same continent which Jenkins seems to think is covered in shared space), in which, rather than segregating the vulnerable user away from the car, the car is segregated away from the vulnerable user. Segregation, in other words, works for the convenience of pedestrians and bicycle users, rather than for the convenience of the motor vehicle. 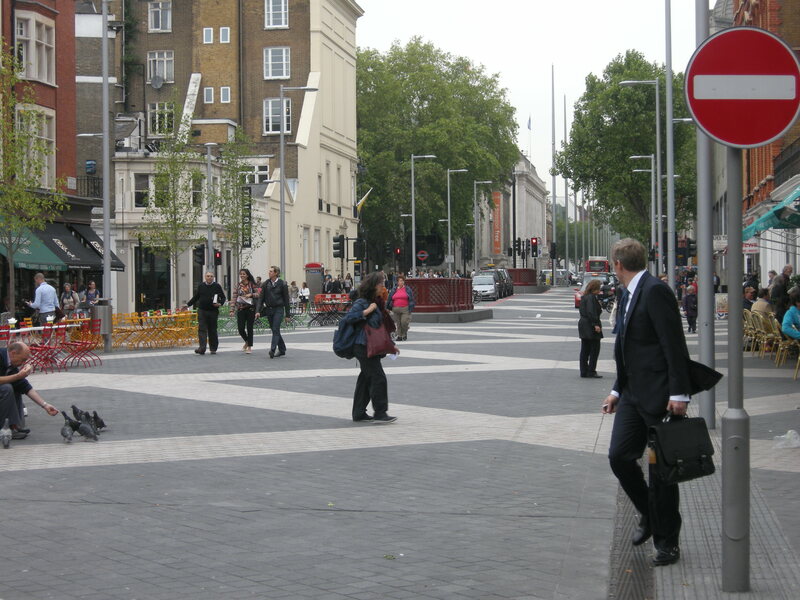 The streets and roads are designed preferentially for people on foot and on bicycle. This could mean, for instance, roads closed to motor vehicles, entirely; it could, elsewhere, mean a drastic reduction in the amount of space given to motor vehicles. But in all cases ‘sharing’ between motor vehicle and pedestrians is not assumed; the streets are physically given over to bicycles and walkers. 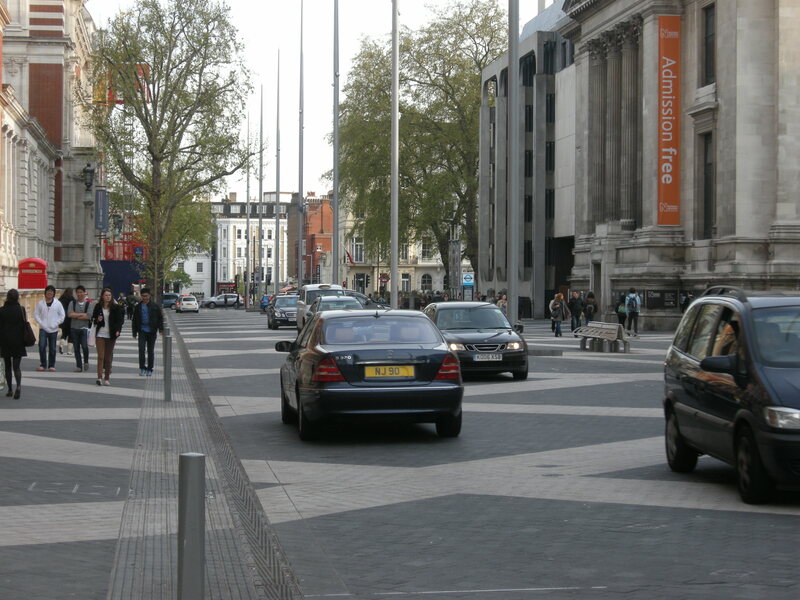 This approach – what you might call ‘benign segregation’ – gives over more space to vulnerable users, just like shared space is supposed to do – but, crucially, without that extra space being shared with motor vehicles. Most Dutch towns and cities are now benignly segregated, with motor vehicle journeys in their centres being made either impossible, or inconvenient by comparison with other modes. Nothing in the [Times’] campaign indicates familiarity with new traffic theory as applied to cyclists, which is strange when its best exemplar, Exhibition Road, has just opened in South Kensington. The theory holds that the safety of lesser urban streets lies not in traffic segregation but in its opposite, sharing, since that is most effective in reducing speed. The much-vaunted Dutch approach to cycling relies on drivers getting used to negotiating with other road users through eye contact, especially at natural speed calmers such as crossroads. If Jenkins had bothered to read the shared space literature, he would know that space only gets shared where motor traffic volumes are low enough. And if he knew anything about the Dutch experience, it’s not about less control. On the contrary, there are lots of controls both to keep motor vehicles away from cycles, and to keep motor vehicles out of residential areas – the shared spaces that he seems to think are free-for-alls. In fact, as I write this I’m realising it will simply take too long to refute and correct all the nonsense in this article – it’s like trying to review an article about brain surgery written by Katie Price. The ability of road engineering and regulating to make London cycling less dangerous must be exhausted. Cycling on traffic-filled streets is inherently risky. A passage in which Jenkins, in the second sentence, accidentally grasps the real safety problem, while in the first sentence amazingly assumes that all solutions to that problem, other than shared space, have already been ‘exhausted’. The issue is motor traffic; if your streets remain ‘traffic-filled’ then of course cycling will remain inherently risky, simply by virtue of a greater number of interactions. The solution is to separate; not by pushing cyclists and pedestrians into underpasses, or behind barriers, or making them wait together on pavements using toucan crossings, but to reclaim urban space for both these groups. 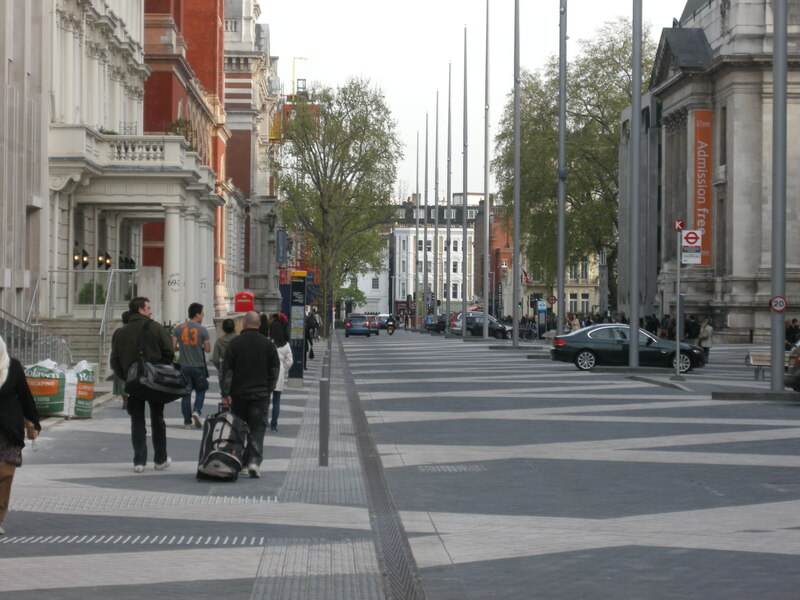 And now, after that circuitous introduction, I can turn to the subject of this post – Exhibition Road, and what we can learn from its redesign. Setting aside the eye-watering cost, if you can, the redesign has been greatly valuable in a way that was probably unintended, because it has served to demonstrate the conditions under which shared space works quite well, and those under which it doesn’t work in anything like the way intended (or – how it functions less optimally for pedestrians and bicycle users than other possible street arrangements). 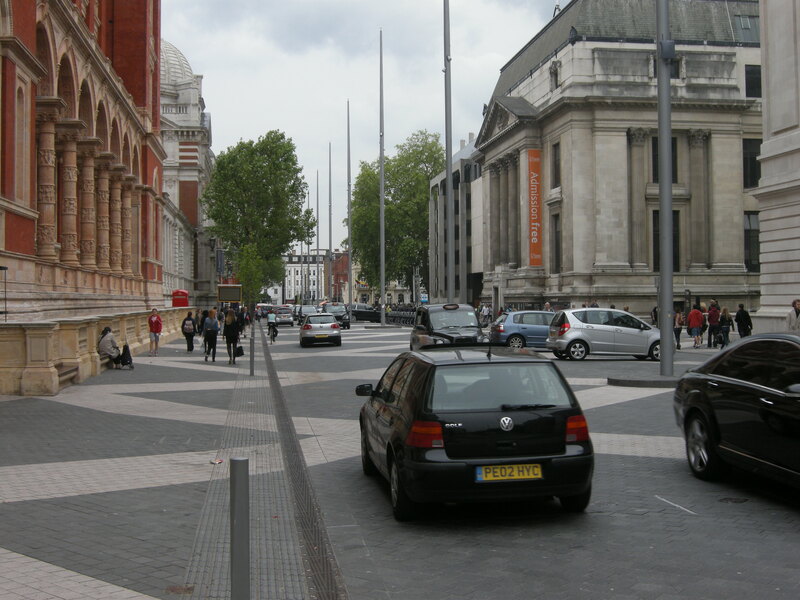 This is because there are two distinct sections of Exhibition Road which, while virtually identical in design, function in completely different ways in practice. 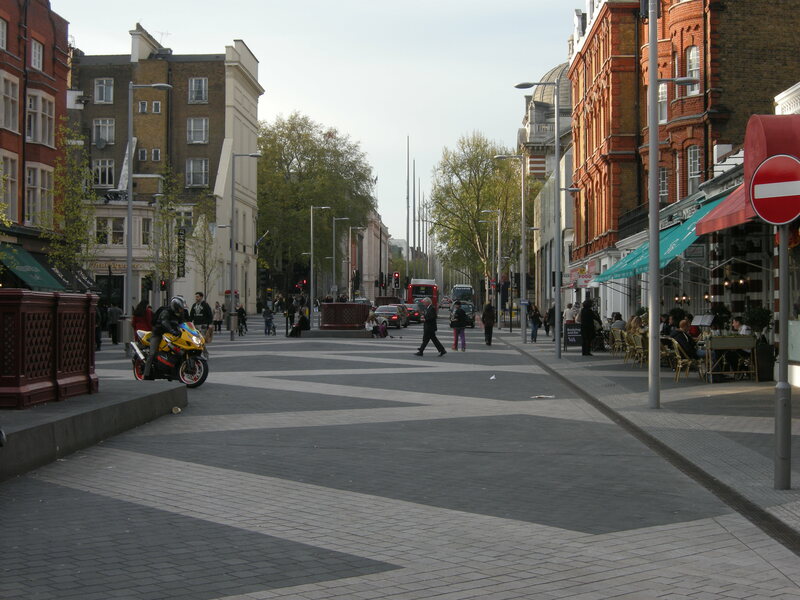 The southern section, south of the A4 Cromwell Road is rather splendid, and works as shared space should – with plenty of actual… sharing. 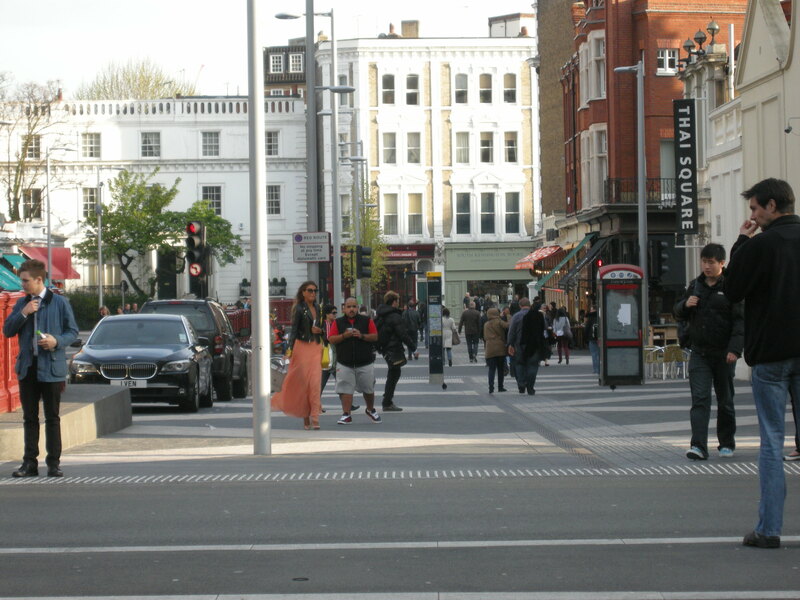 There is nearly always mingling across the full width of the street by pedestrians. People are still prepared to mingle and linger even when the occasional motor vehicle approaches. This ‘innate’ sharing is only partially a function of the design. 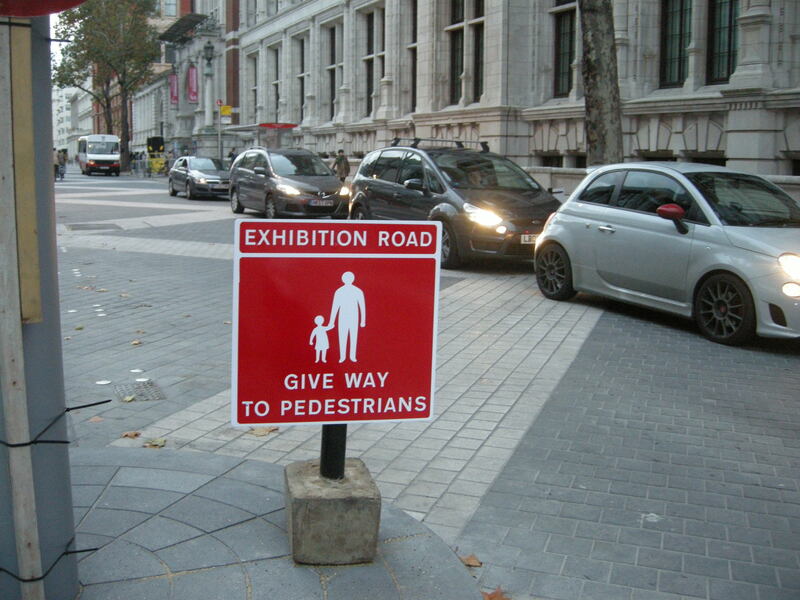 Indeed, it has to be due to something else beyond the design, because (as we shall see) the layout of Exhibition Road north of Cromwell Road is identical, yet pedestrian behaviour is very different there. Now it is probably true that people would be less likely to mill across the street if, instead of a uniform surface, there was clear demarcation between pavements and a tarmac road. 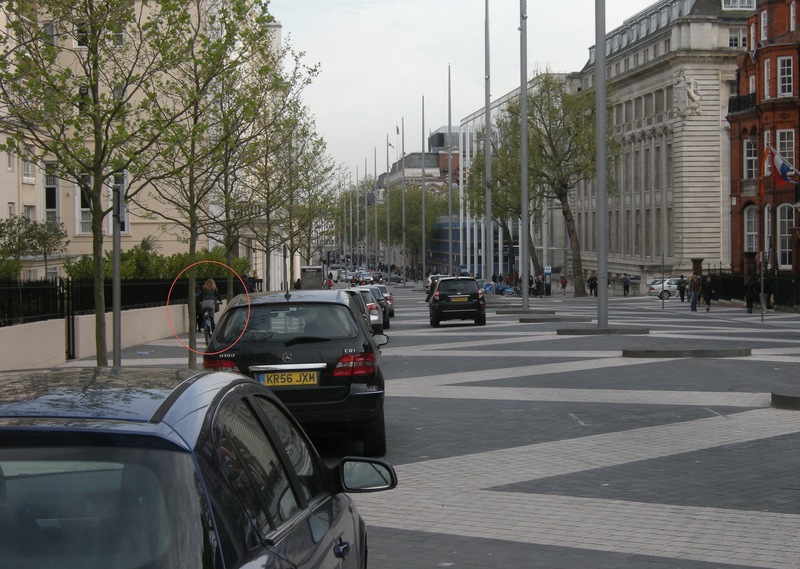 But far more important in enabling ‘sharing’ is the fact there is actually a large degree of ‘separation’ on this section of Exhibition Road; the separation of people and motor vehicles. There is very little motor traffic travelling through here – you can see this from the photographs above – principally because the road does not go anywhere. It only sends you around a one-way system, leaving you right back where you started – as this coach driver is finding out, as he goes into reverse. Very little motor traffic means that people are happy to take their time crossing this space. And the scarcity of motor traffic means that when a motor vehicle does pass through here, it is most definitely on the pedestrians’ terms. 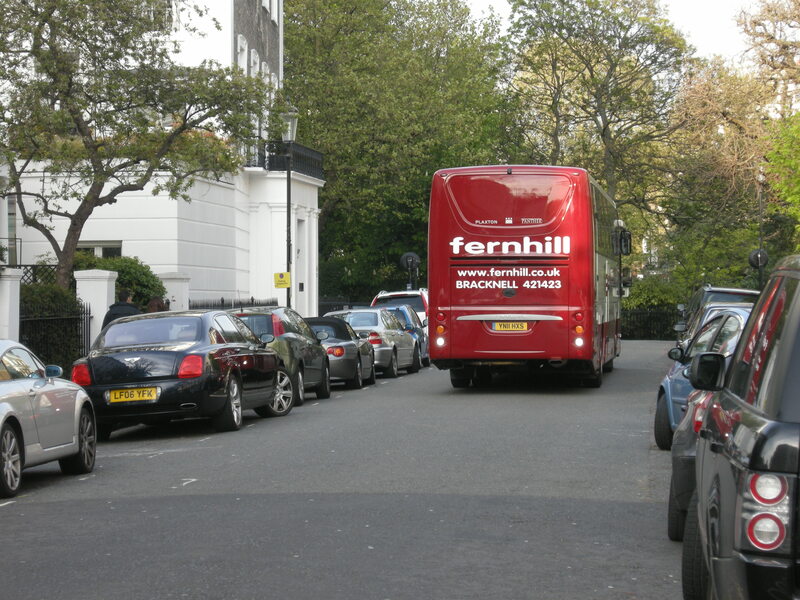 A car or a van is almost always on its own, and has to abide by the behaviour of the pedestrians surrounding it. We were even able to stand in the middle of the road and have a discussion – despite this being a fairly ordinary looking tarmac road with double yellow lines. Why? Because there are very few motor vehicles driving along here, and when they do, they are forced to share by virtue of the numbers of pedestrians. There isn’t really any need at all for a ‘shared space’ treatment here in order to encourage sharing – because it is happening naturally. 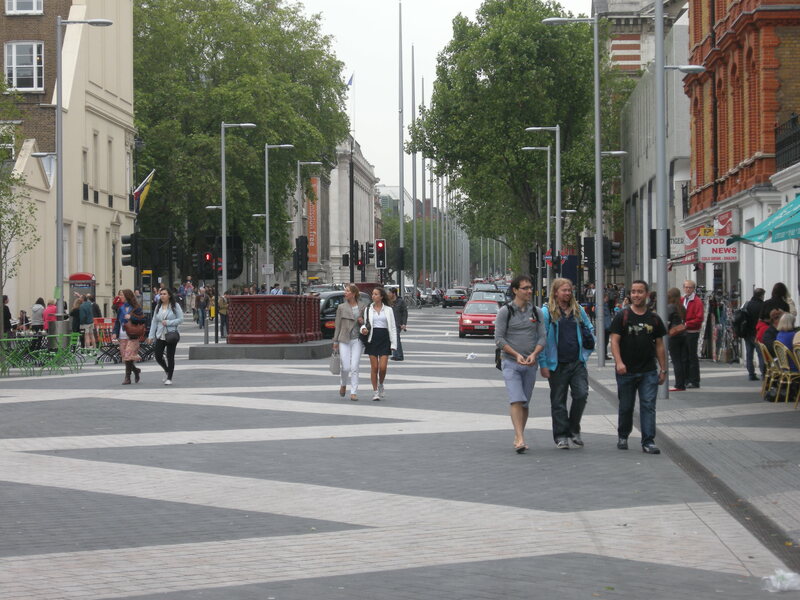 Equally, we also know that it can’t be the uniform surface that is solely responsible for encouraging pedestrians to mingle and share because on the northern section of Exhibition Road, identical in design to the southern portion, and with just as many, if not more, pedestrians on it, mingling is completely absent. in effect, asking them to play chicken with fast and often heavy traffic. Nobody wants to play, and pedestrians have separated themselves, despite the ‘pattern’ of the street inviting them to do so. This isn’t just true of pedestrians. 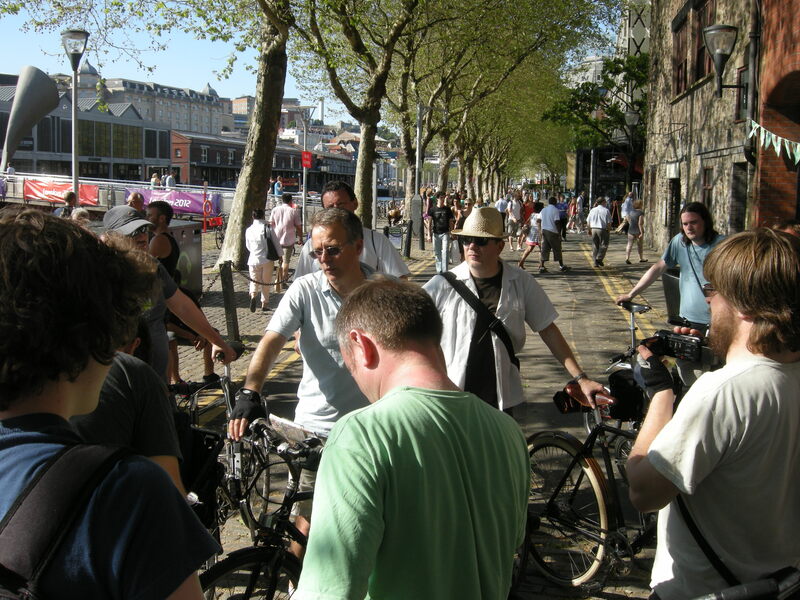 I’ve seen people on bicycles creating their own cycle paths, away from the ‘vehicle space’ – effectively cycling on ‘the pavement’, precisely the same kind of behaviour we see on other roads where people using bikes don’t want to cycle among motor vehicles. 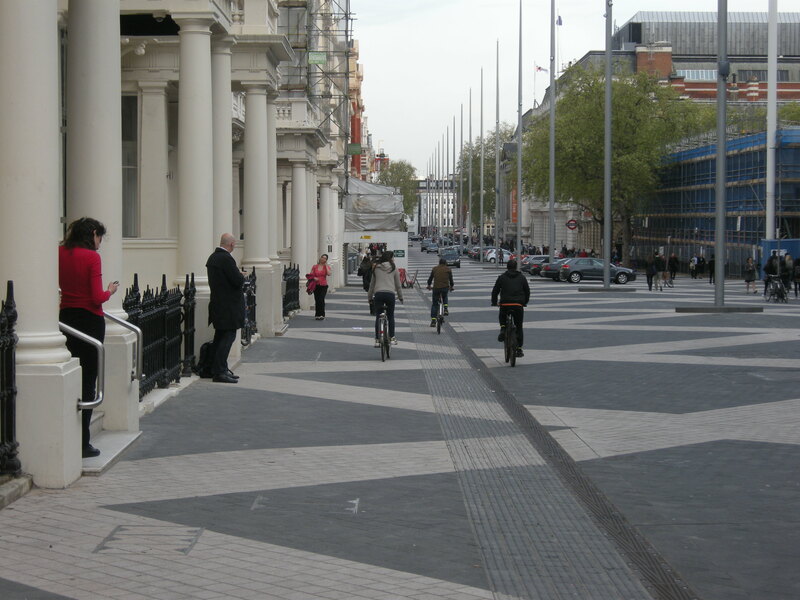 These are supposed to be ‘pavements’, of a sort – divided by the ridged markings to denote to blind people where the ‘road’ starts, but as this is a shared space, you can technically cycle anywhere, and some people are choosing to cycle where it feels most safe. This is a reflection of a lack of subjective safety. And pedestrians don’t want to ‘share’, either. Unlike the mingling in evidence in the southern section of the street, the users are split very markedly, by mode, in the northern section. Some bollards have been installed to keep motor vehicles off the ‘virtual’ pavements, but what this seems to have achieved in practice is the creation of an actual pavement, behind which pedestrians keep at all times, unless they are trying to cross the road. This ‘pavement’ is also a natural consequence of the straight guttering, the trees, and the parking at the northern end of the road. Precisely the way that pedestrians would behave on an ordinary road, in other words. but those have all disappeared, as has any inclination of almost every driver to yield, even if it existed in the first place. To cross the road in a way that involves ‘sharing’ necessitates walking in front of vehicles that are bearing down on you; something that few people are willing to do. Take a look at this video of a lady trying to cross the road, while carrying her child. For about 45 seconds (she may have been waiting longer, before I chanced upon her) she doesn’t attempt cross. You can see why; to do so would involve stepping into the path of motor vehicles. When she does start to cross the road, it is only when a gap has emerged in the traffic. She was not aware of the car approaching from the southern end of the street, and halts, uncertainly, in the middle of the road, when sees it. Confronted with the sight of a stranded mother carrying her child, the driver yields and lets her cross. The behaviour here is instructive. Yes, yielding occurred, but only when the mother had quite literally put her body on the line. As we see for the first 45 seconds of the video, she wasn’t prepared to do so voluntarily. This is not ‘sharing’ in any conventional sense of the word. To me, this represents the biggest flaw in what I would call the ‘total shared space’ philosophy; the belief that we can calm and civilise practically any street or road by removing distinctions and making surfaces uniform. The philosophy is holed below the waterline by the fact that the vast majority of people, just like the mother in this video, are not prepared to force motor vehicles to share. Another example below. 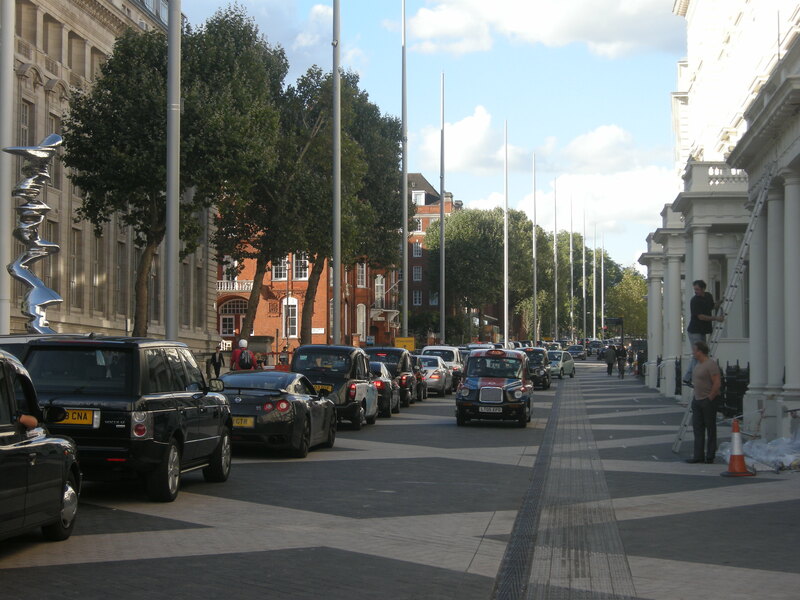 That reluctance means that streets like Exhibition Road – with significant volumes of motor traffic – will continue to function in more or less the same way they did before. The inescapable conclusion, therefore, is that what marginal improvements do result are simply not worth the expense of rebuilding the road, if motor traffic is not greatly reduced, or removed entirely. much easier and even more pleasurable for families visiting these unique attractions with space to wander unhindered in an area that puts people first. 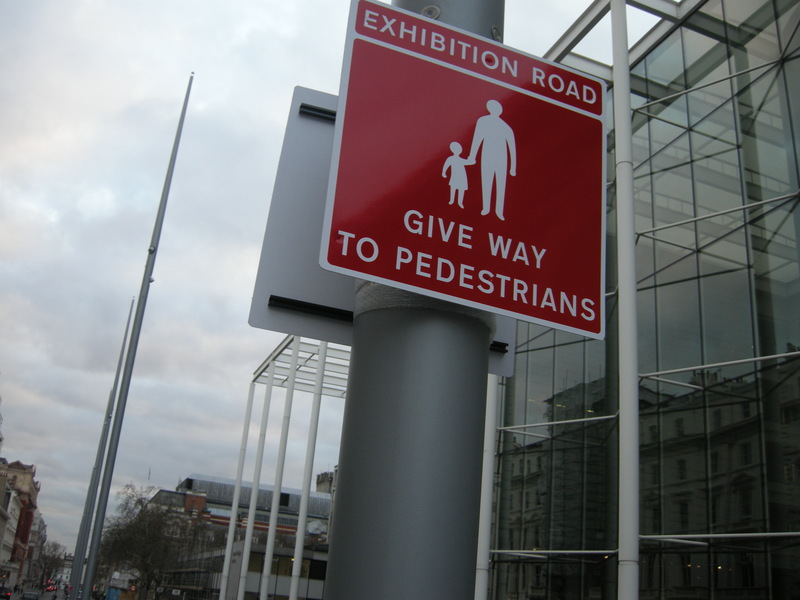 There is no ‘unhindered wandering’ on Exhibition Road, especially by families with children (I have on several occasions witnessed parents telling their children to behave and to ‘stay out of the road’). Presenter It’s quite liberating walking down Exhibition Road, because we can go wherever we want. Ben Hamilton-Baillie It feels quite different, doesn’t it. And interestingly traffic is still flowing up and down here. Presenter There are benches in the middle of the street! Ben Hamilton-Baillie We’re walking where once was you would have felt crazy to be walking up the carriageway. And yet a street of this kind can cope with a huge volume of visitors from all over the world. It can cope with taxis and buses and bicycles and couriers without having to install complicated barriers and different levels and different traffic signals and so forth. There is a degree of uncertainty, intrigue, and as soon as the driver’s brain is engaged, the speeds drop, and the responses to the unusual, the unexpected, the individual, become immediate and responsive, rather than assumed. There aren’t any benches in the middle of the street; they are only found in the explicitly pedestrianised western section, by the Science Museum. This suggests that the presenter and Hamilton-Baillie are walking in that area (which admittedly was formerly part of the road, hinted at in Hamilton-Baillie’s comment), rather than in the carriageway. But the impression given to any casual listener is that the two of them are wandering aimlessly all over the street, which is misrepresentative of actual behaviour. is not founded. Simply creating a uniform street has not been enough. Groups representing blind people know this especially well. the road is clogged, all too often, with motor vehicles. Heavy traffic still exists. 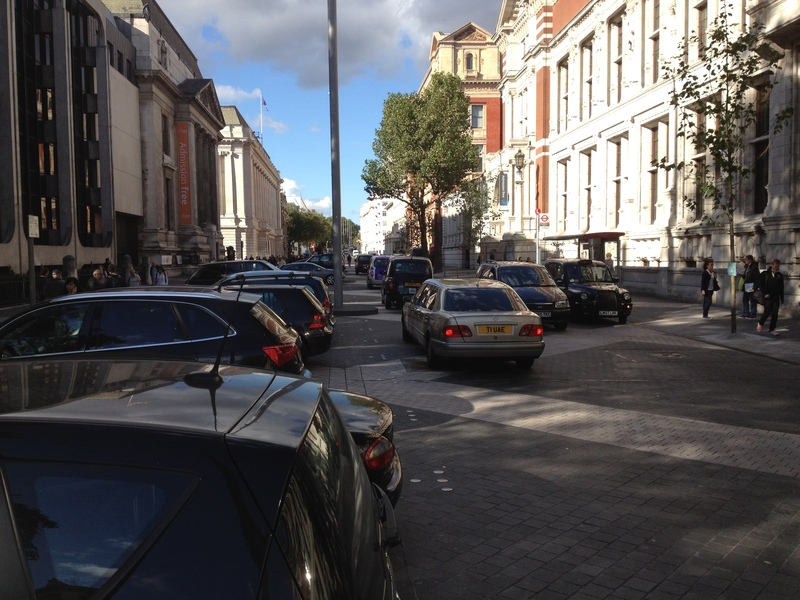 It is this very same traffic that is rendering the expensive rebuilding of Exhibition Road somewhat redundant. If the road is to start working as a genuine ‘shared’ space, it has to be removed, or greatly reduced. This entry was posted in Boris Johnson, Go Dutch, Guardrail, Infrastructure, London, Pedestrianisation, Shared Space, Simon Jenkins, Subjective safety, The Netherlands, The Times' Cities Safe for Cycling campaign, Transport for London. Bookmark the permalink. Slightly off topic, but on reading your very interesting article I find myself wondering how much the language we use contributes to our feelings either way. Despite the often unpleasant reality here, at its most simple “sharing” is generally considered to be a good thing. In contrast, google “segregation”, and you will be forced to wade through a lot of results about racial segregation long before you get to anything about road design. Segregation, used out of context, is rarely considered desirable. I’m sure marketing people would have something to say about this. Perhaps something to think about in the efforts to win hearts and minds. I think in this context, the American choice of ‘protected’ bike lanes is a much better choice. Protected because cyclists are separated from traffic by physical barriers (kerbs, trees or parked cars), but also protected from being treated as parking spaces, which is all too common for ‘paint only’ bike lanes. Segregated lanes has too many negative connotations to work there, and ‘mandatory’ lanes raise too much uncertainty over whether they are mandatory for cyclists to use, or for drivers to avoid. A cogent analysis. It is amazing how the ‘shared space’ concept took hold so rapidly and on such a flimsy basis. My only caveat is that one shouldn’t accuse Simon Jenkins of lying. He may well simply not have done enough research and been too eager to grab at simple answers that fitted in with his pre-existing ideas – it’s a common failing and probably explains how this concept won such wide support among architects and traffic engineers even though it was obvious that it would not work in the way predicted. Tim’s point is also good one – how about trying to shift usage to ‘dedicated’ rather than ‘segregated’? Point taken on Simon Jenkins. I think it’s unlikely he hasn’t visited Kensington High Street – he lives in London – but I’ll amend it. Likewise on terminology. Segregation is an ugly word, and it is a hindrance to have been lumbered with it. Having seen this point mentioned in the latest blog post, I like for “dedicated”. “Dedication” has far more positive overtones – being dedicated is usually a good thing – and to me this more clearly indicates that the facility is specifically for cyclists, rather than the shared pavements we so often see. 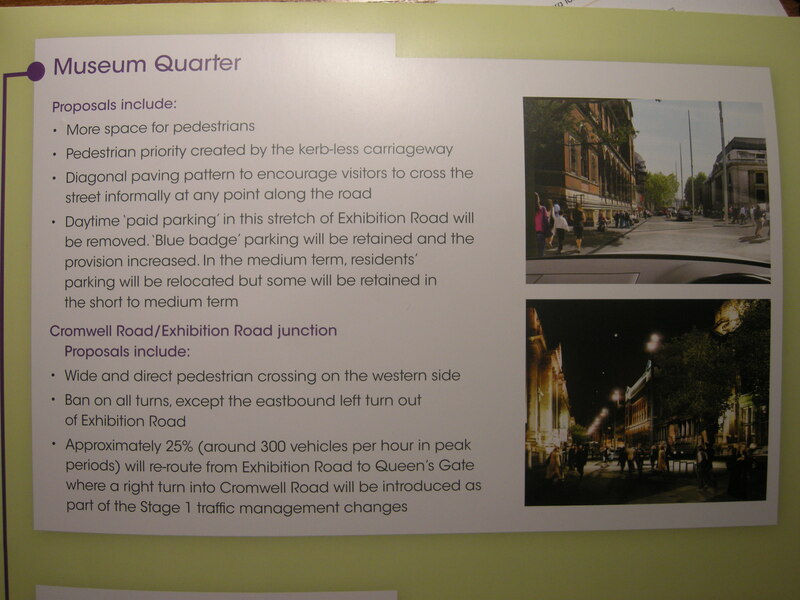 Here in Manchester we are due to see the formal proposals for the facilities on the very busy Oxford Road shortly, and the drawings I’ve seen had cycle lanes between the bus lane and pavement (with large bus laybys outside the cycle lane 😦 ). There was some debate about whether the cycle lanes should be at the height of the road, to allow cyclists to move into the road, or at the height of the pavement, risking them being full of pedestrians. I personally fail to understand why we have to choose one or the other. I want a path dedicated to cyclists. Not sure how easy it is to change the terminology widely, and there’s also confusion over the various forms of cycleway/cycle-path/cycle-lane/etc . Is it physically separated, away from the road? What do we mean by all this? It would be great to see a clear glossary (or maybe a wiki?) with pictures/diagrams which everyone agrees on (tricky?) so we could discuss all this without getting in a muddle. Also it could explain terms like grade separation, which of course means something different again. Maybe something for the CEoGB to consider? Don’t forget, there is a clique of designers out there who are making a living out of this and other concepts which are underpinned by flimsy data or objectives at best. Some of these people always seem to be invited to speak at training courses (TfL always seem to have them) and they often criticise other approaches (don’t mention segregated cycle tracks!). The problem is that they eat out on the designs for a long time, but don’t have to live with the schemes. I am not saying that the designs are inherently dangerous, but for me, the main section of Exhibition Road is still a traffic dominated mess. If someone who wandered up from the other end carried on and wandered under a taxi, is it their fault or a problem with the design. A post coming on I think. 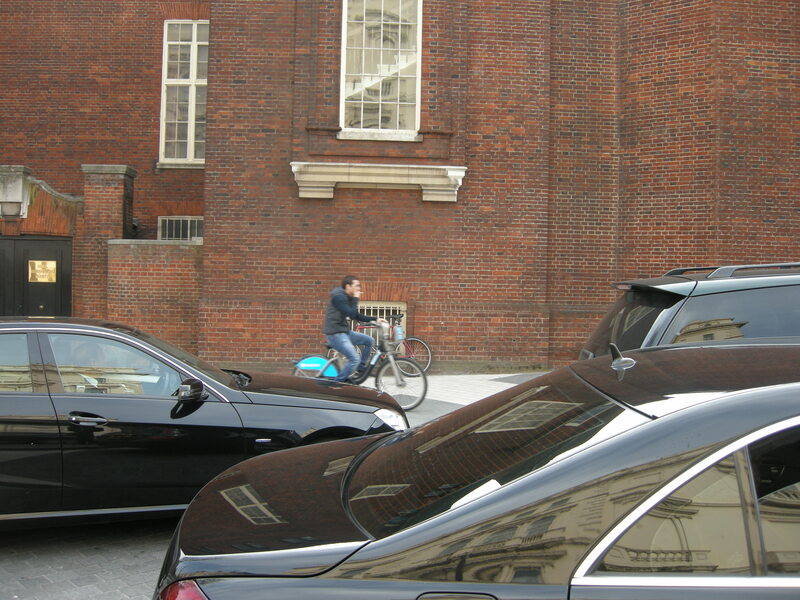 Simon Jenkins is totally wrong regarding Kensington High Street which in effect functions as a dual carriageway with the cycle parking in the middle forming what is in effect a definite central reservation. If Go Dutch will ever be brought to the proposed cycle superhighway along Kensington High Street to Hammersmith and East to Knights bridge then the entire scheme will have to be ripped out wholesale to accommodate segregated cycle lanes. What’s worse is that at either end of the modernised stretch the road is incredibly unpleasant for cyclists with pinch points, changes between single and multiple lanes, no ASLs, and incessant traffic. That road is divided up with bollards and a central reservation made out of cycle parking. Now this might be nicer stuff, on nicer paving, but it is still “clutter”. On the busy section there is clearly no change in function, and the enforcement of that function is done in exactly the same way, with “clutter”. I would like to use one of the images on this page in a publication that I am producing and would greatly appreciate it if you could contact me at TAL [at] dft.gsi.gov.uk to discuss permission to reproduce etc. Interesting article. A retired engineer/transport planner who was on of the pioneers of pedestrainization (Ilford and Stratford, working for GLC), took to Manchester – saw need for cycle provision when visiting Holland when planning Manchester Metro. Am completing book “Transport and Society – the British Experience” – one of last aspects I am exploring is “Shared Spaces”. Internet very useful! Excellent piece. It was definitely worth writing!